Hi Buddyfighters! 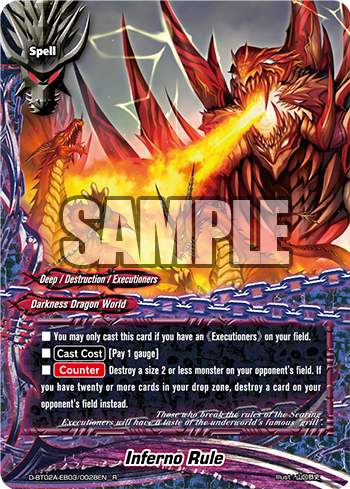 The Triple D Booster Pack Alternative Vol.2 (D-BT02A) “Four Dimensions” releases tomorrow! Who’s excited?! Step into the new worlds with D-BT02A “Four Dimensions”! In this last segment of the “Four Dimensions” series, we are going to feature D-EB03 that can be played with the new flag Searing Executioners. 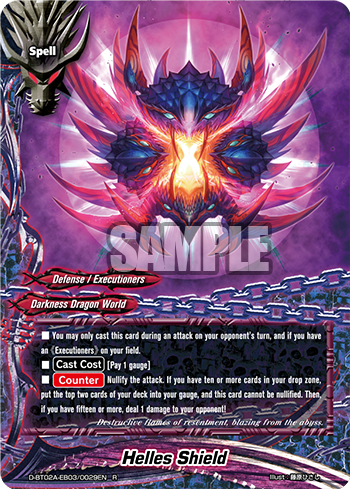 If you haven’t, check out our card reviews for the first, second, and third dimensions as well! 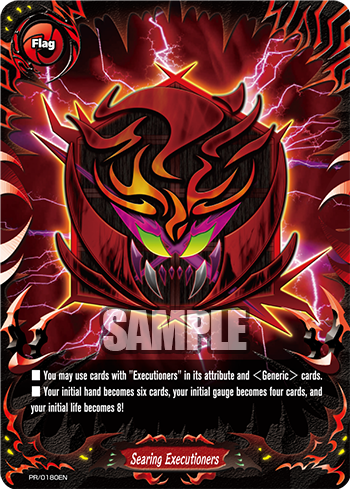 Searing Executioners is a brand new flag which allow any cards that bears the “Executioners” in its attribute to be used in the deck, alongside with <Generic> cards. Players using this deck will start their game with a life of 8 and four gauge. 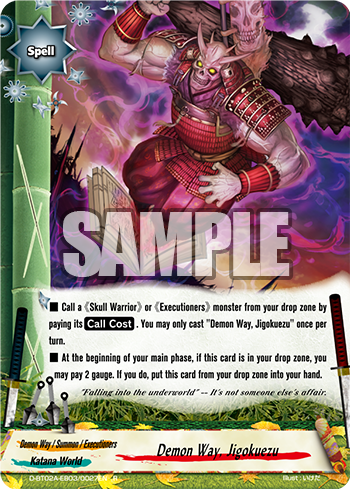 The unique style employed by the Executioners is to reap the benefits of having as much cards as possible in your Drop Zone, which in turn allows the player to gain more cards in hand and gauge. 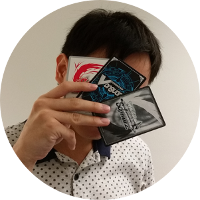 We will be showcasing some cards that you will find most essential for your “Executioners” deck. “Gate of Verdict, -Judgement-” is a [Set] Spell card that shouldn’t be missed out in any 《Executioners》 deck. Not only can it fuel more cards into your Drop Zone, it can also provide additional gauge. Additionally, once you have fifteen or more cards in your Drop Zone, it allows you to draw an additional card by retrieving 1 《Executioners》card that was sent to the Drop Zone! . 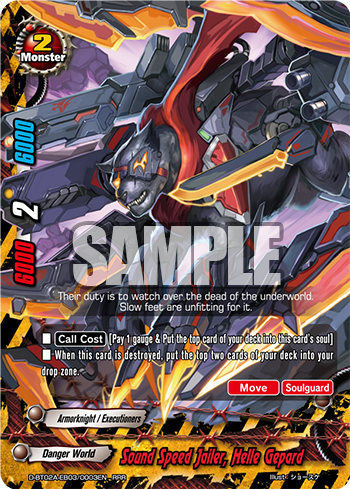 “Sound Speed Jailer, Helle Gepard” is a really versatile and resilient 《Executioners》monster that has the [Soulguard] and [Move] ability, giving itself a soul as it is called. When this card is destroyed, you can put the top two cards from your deck to your drop zone, which allows you to increase cards in your drop zone! Also, with its strong attack and defense power of 6000, you can clear a lot of your opponent monsters with ease! “Tempest Jailer, Helle Cougar” can provide a lot of neat advantages with its attack. You can gain 1 life whenever you destroy a monster or deal direct damage. In addition to that, if you have a “Gate of Verdict -Judgement-“ on your field or you have ten or more cards in your drop zone, you also get to draw a card! With its [Double Attack], you can potentially draw two additional cards and gain 2 life. Having more cards allows you to unleash many combinations of abilities, and the extra life gives you the added insurance, since you start the game with fewer life. It might look like any other ordinary shield that protects your monsters and yourself, but there is more to it than meets the eye! “Helles Shield” gives extra abilities when it is cast based on the number of cards in your Drop Zone. If you have ten or more cards in your drop zone, you can give yourself two additional gauge and its ability cannot be nullified. If you have fifteen or more cards in the Drop Zone, deal one damage to your opponent. A truly powerful spell indeed! A card that can destroy any of your opponent’s size 2 or less monster. If you have twenty or more cards in your Drop Zone, it can destroy any cards on your opponent’s field. Use it to get rid of any card that are hindering your strategy! An important card that can call any 《Executioners》from your drop zone to the field. 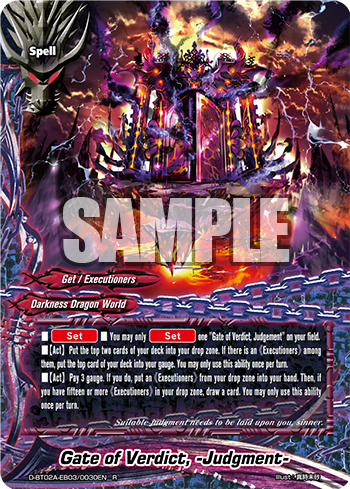 This card solves your problem of playing 《Executioners》 monsters you might want to your field, since a lot of 《Executioners》cards are sent from the top of the deck to the drop zone by the abilities of your cards. Also, when this card in your Drop Zone, you can get this card back to your hand by paying two gauge. 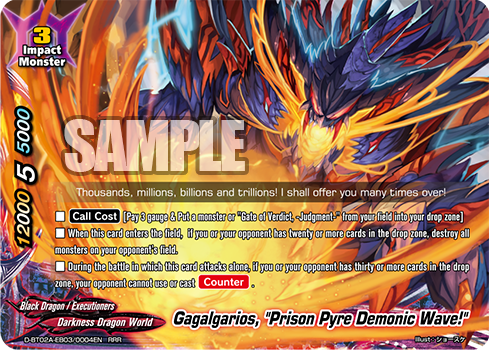 Gagalrios, the Impact Monster of this flag, and the “boss monster” of 《Executioners》! 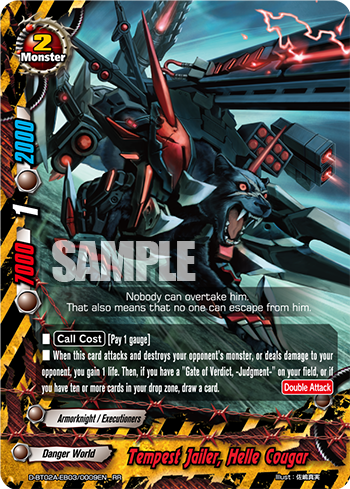 When this card enters the field, it brings forth destructive powers based on the number of cards you have in the Drop Zone. Not only does the card possesses potential to clear your opponent’s monster, it is made more powerful since your opponent cannot use or cast [Counter] abilities. It helps to finish your opponent without the fear of getting its damage reduced or nullified. That basically wraps up the “Four Dimensions” series! We have covered the 4 different sides from this set, and it certainly provides some new playstyles and unique type of cards to the game. Do look forward to this set’s release tomorrow!